Netizens' biggest beef with foreign talent in Singapore is that the latter "take and they go", a Yahoo! Singapore poll shows. In the poll, which ran for one week up to last Friday, netizens were asked what was their top concern regarding foreign talent in the country and were presented with six options. Over 30,000 netizens took part in the Yahoo! poll. The fifth option, which states "Many are here only for short-term benefits. They take and they go" garnered more than 12,500 votes or 41 per cent of the total. The issue of the quality of talent coming in scored the second-highest with 22 per cent of the total votes followed by the concern over the strain on limited resources exerted by the foreigners with 15 percent. The null option, "We have only ourselves to blame for low birth rate", garnered 12 per cent of the votes, perhaps demonstrating recognition of the country's need for foreigners. The third and fourth options about not having to do National Service and not trying to integrate, respectively, took 5 per cent of the votes each. Netizens who spoke to Yahoo! Singapore shared mixed reactions to the results of the poll. Yahoo! 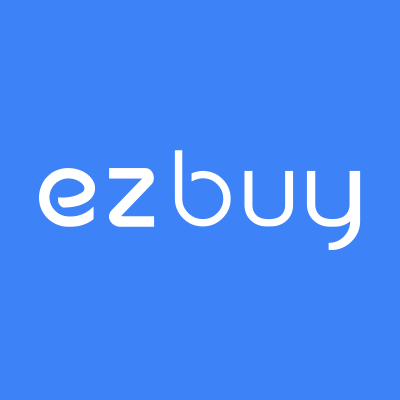 reader singaporeancars1206 agreed with the most popular option. "I find that many of them (foreign workers), especially in the service sector, have a very entitled attitude," he said. "They know that they have greater priority than us, they know they get more benefits for lesser cost than us, and they know that they have no stake in this country, so they behave as if Singapore is here to serve their needs, instead of the other way around," he added. 26-year-old Anthony Tsang adds, "The FTs (Foreign Talents) see Singapore as a base to go elsewhere better." "They stay in Singapore, learn English, excel and then move on," said Tsang, who works in sales. "They never really attempt to give back except for a few." Others, such as 25-year-old Alex Cheong, who interns at a public relations firm, believes that the issue lies more with the lack of integration on the part of foreigners into Singapore. "They (foreigners) just need a bit of common sense, EQ and understanding that they're a small part of a larger community," he said. "They don't need to be acting exactly like us, because difference is okay, but just be respectful and mindful of the fact that they're the foreigners," he added. 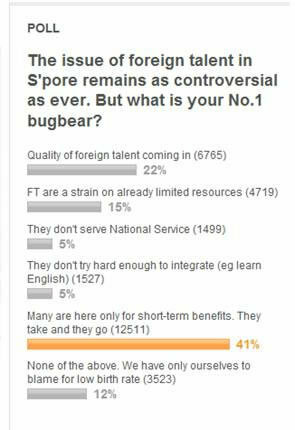 Foreigners living in Singapore have found themselves agreeing with the situation, but told Yahoo! Singapore that they are here to meet an immediate need. "It's more of a need for their services," said Welyon Sutjipto, 23, an Indonesian who has lived in Singapore for 14 years. "It happens everywhere and every country has to rely on a bit of the migrant workforce. On our part, there shouldn't be an expectation of their desire to acclimatise and settle down in Singapore," he added. When asked further about the alternative to the "take-and-go" approach for foreigners, netizens argued for more selective acceptance of foreigners into Singapore. 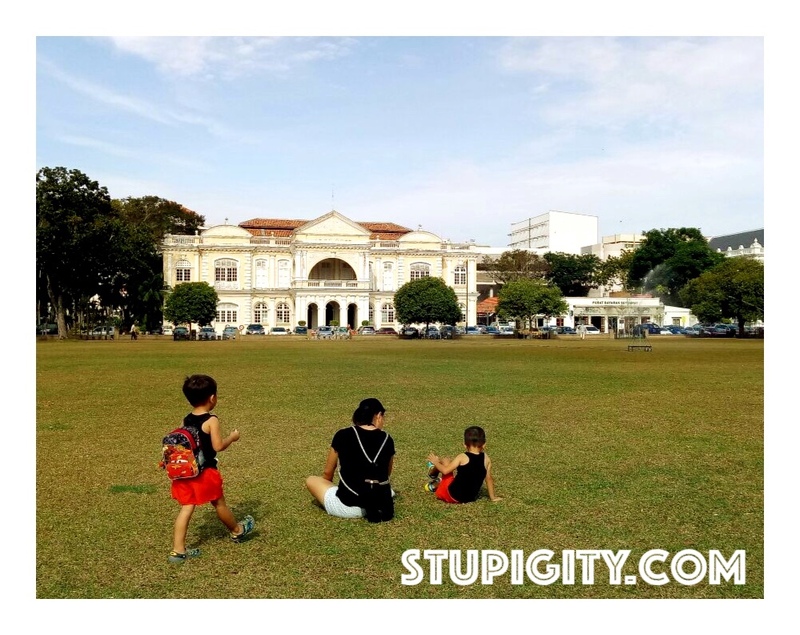 "I'd rather have fewer (foreigners) with good attitude, able to speak English and are grateful to be here than the multitudes who are here, who take it for granted that they can work here and mess up our country," said singaporeancars1206. "The barriers to entry are too low, which is why anybody can come in, and when anybody can come in, you end up with FTs that take Singapore for granted," he added. "If we can be selective about who goes into government, surely we can apply that selectivity to who comes into our country."